Today marks the 75th anniversary of “the great escape”, the mass breakout of allied airmen from the Luftwaffe-operated Stalag Luft III in Sagan-Silesia—now Zagan—in Poland on March 24, 1944. Of the 76 men who escaped, only three made it to freedom and 50 of the group were murdered by the Nazis in retaliation. Paul Brickhill, one of the Allied officers who had worked on the various tunnels used for the escape, wrote the definitive account of prison camp life, the famous March 1944 breakout, and the subsequent fallout in The Great Escape, published in 1950. 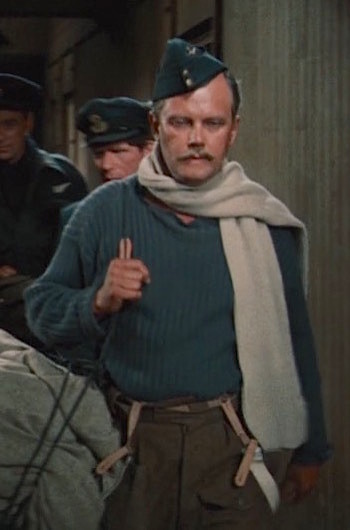 Thirteen years later, a star-studded cast reenacted the incident in The Great Escape, a now-classic war movie that dramatized this real-life story of heroism, humor, and tragedy. 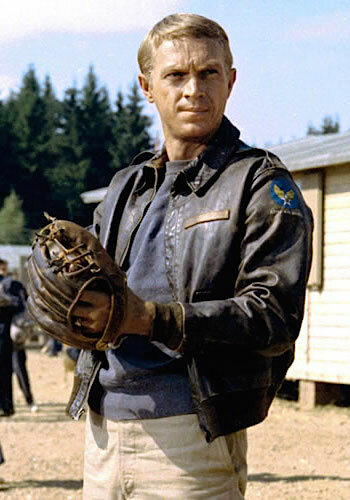 Today’s post—coinciding both with the 75th anniversary of the escape and the 89th birthday of the film’s star Steve McQueen—examines the uniforms of the Allied airmen, sorted by each major character’s surname. 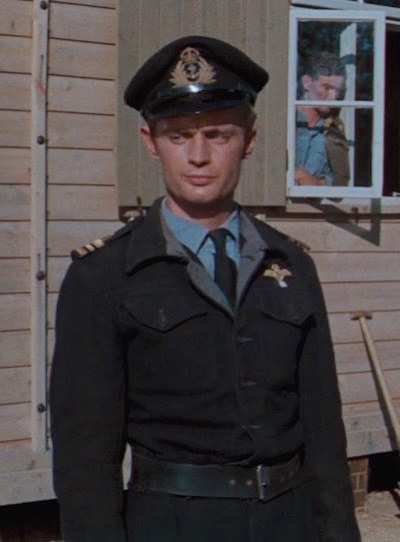 Luckily for the escapees, service uniforms and battle dress during World War II were close enough to the cut of civilian suits that they could be converted with relative ease by the camp’s tailor Tommy Guest, renamed Griffith for the film character played by Robert Desmond. Robert Desmond, Richard Attenborough, James Coburn, and Gordon Jackson in The Great Escape (1963). 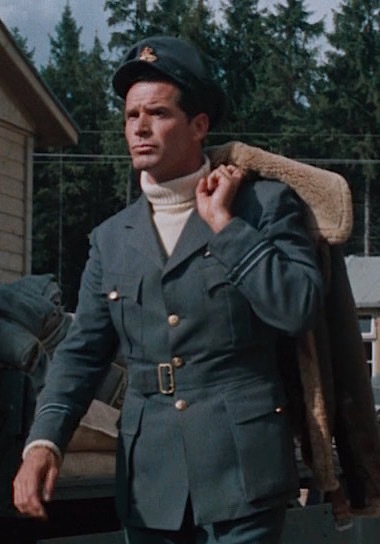 Desmond played Flying Officer Griffith, a fictionalized version of the real camp “tailor”, Tommy Guest. Tommy Guest also dispersed his tailors in rooms throughout the compound. Cloth was his main trouble. Mostly he took old uniforms to pieces and recut them along civilian lines. He got bits of cloth smuggled in from outside and sometimes used the heavy linings from old greatcoats. The only jackets and trousers ever issued in the compound came through the Red Cross, and they were either rough old Polish uniforms or the unlovely stuff they issued (and still do) to RAF “other ranks”—made of heavy serge. Guest had a couple of people shaving the serge nap off with razor blades to fine the cloth down, and then he dyed it—with beet-root juice, or a boot-polish solution, and once or twice in dyes made from the covers of books soaked in water. He made himself a stock of paper patterns of various sizes by cutting them out of sheets of German newspaper. It greatly simplified the business of reshaping clothes. If he didn’t have time or cloth to make you a suit himself, he would—if he was in a very good mood—lend you his paper patterns. He usually did the cutting for the difficult suits himself. Guest’s tailors kept on working to the last day, and by that time they had hand-sewn nearly fifty complete suits; and most of them would have been a credit to some of the tailors I have met. They were mostly for the train travelers who had to look the part. A lot of the hardarsers were converting old uniforms. It didn’t matter so much if they looked as though they were wearing hand-me-downs. However smart they were when they left, they were going to look pretty scruffy after a few days’ trekking. Guest showed them how to shave the nap off the cloth and dye it, lent them his paper patterns, and gave them civilian-type buttons. Note: I am not, by any means, an expert historian on the military or its uniforms. 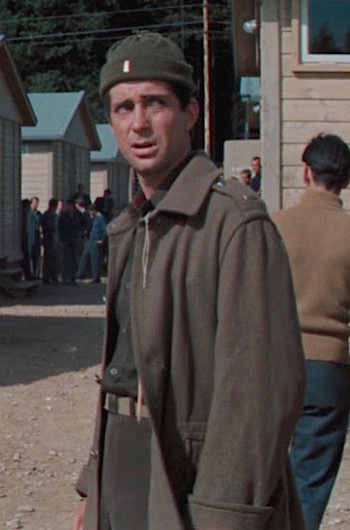 I wanted to write a comprehensive piece like this because little about the uniforms of The Great Escape—or British battle dress, in general—seems to live anywhere on the internet. I welcome any constructive feedback from anyone more knowledgable than me that would give this post greater historical accuracy and increased value to readers. Lieutenant Commander Ashley-Pitt’s battle dress verges on anachronism as battle dress wasn’t introduced in the Royal Navy until 1943, and it’s hardly likely that the young officer who had reportedly been imprisoned long enough to establish a reputation for mastering the art of escape would be sporting such a recent version of the uniform. Army battle dress was authorized for RN use two years earlier in 1941, but Ashley-Pitt appears to be wearing the No. 5a battle dress developed in 1943 specifically for officers serving in the Fleet Air Arm air branch of the RN. See a historical example here and read more about RN officers’ uniforms during World War II at The Fedora Lounge. …Bushell, vivacious and bright-eyed, was talking gaily. A little too gaily. He looked very smart in the gray lounge suit that he’d saved from Prague, a black overcoat (an RAF coat dyed with boot polish), and a dark felt hat he had somehow scrounged through a contact. His papers described him as a French businessman, and, carrying a little attaché case filled with his kit, he really looked the part. 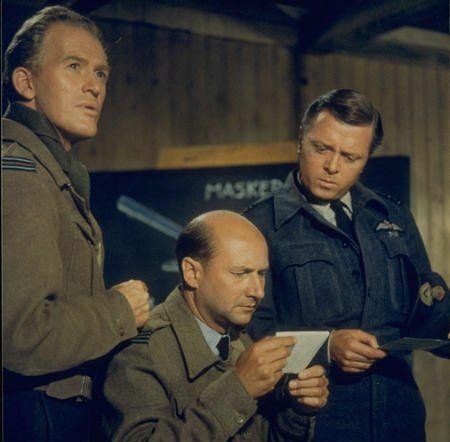 When Donald Pleasence who, by all accounts, had a countenance that served his surname, politely offered advice to director John Sturges, he was just as gently asked to keep his opinions to himself… until Sturges learned from another actor that Pleasence had served as an aircraft wireless operator with the Royal Air Force during World War II and actually spent time in Stalag Luft I, a German POW camp for airmen where he acted in plays to entertain his fellow Allied inmates. From that point forward, Sturges made a point to request Pleasence’s advice and input to ensure technical and historical accuracy. 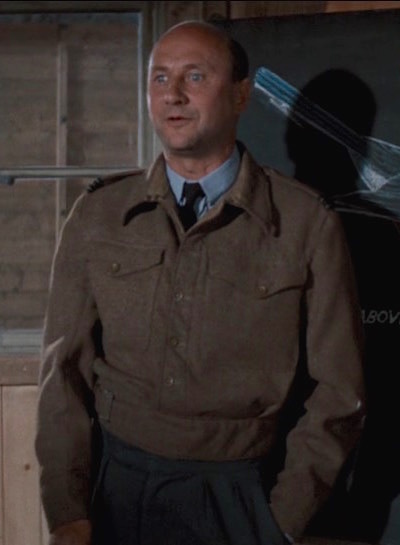 A jacket purported to be Donald Pleasence’s screen-worn battle dress jacket (sans Blythe’s rank insignia and with box-pleated pockets like Mac’s jacket) was auctioned for $2,500 in December 2010. See it here! 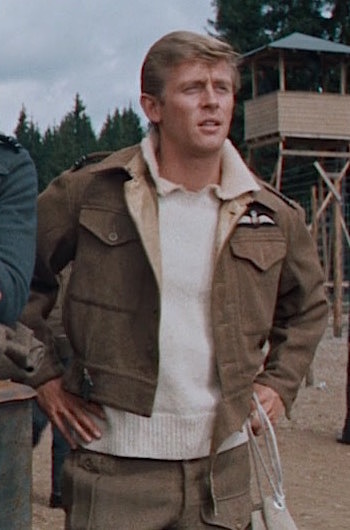 Flight Lieutenant Cavendish is among the more rakish interred airmen, preferring a wide ribbed-knit scarf as his primary outerwear instead of the brown battle dress jacket that he’s seen wearing on only one occasion when marching to camouflage the dispersal of tunnel sand on the compound. His trousers appear to be from the 1949 pattern British battle dress, a slight anachronism evident by the details such as the combination of belt loops and exposed buttons on the pocket flaps. The three belt loops had been a part of 1937 pattern BD but was discontinued in 1940 when the new pattern introduced exposed buttons on the pocket flaps. It wasn’t until the post-WWII 1949 pattern that both belt loops and exposed pocket-flap buttons were a feature. 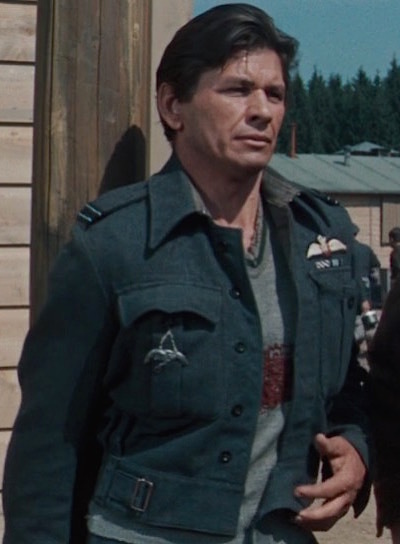 Read more about Canadian airman Wally Floody, one of the real-life Stalag Luft III “tunnel kings”, and his work as a consultant on The Great Escape here. 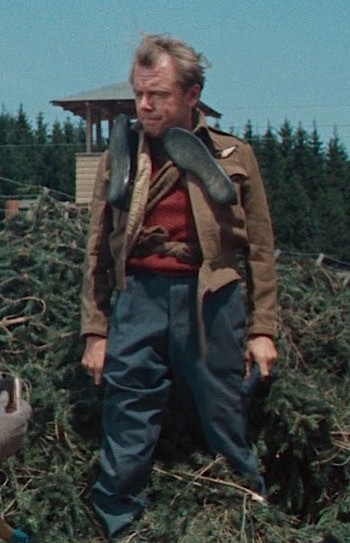 Of the two USAAF officers featured in camp, only Lieutenant Goff wears the more traditional elements of the U.S. Army uniform as Hilts instead wears his flight jacket with a cut-off sweatshirt and chinos of no discernible military issue. Jud Taylor would later direct The Great Escape II: The Untold Story (1988), a mostly fictionalized made-for-TV movie about real-life escapee Major John Dodge, aka “the Artful Dodger” (Christopher Reeve) and his special task force hunting down the Nazis who executed the 50. 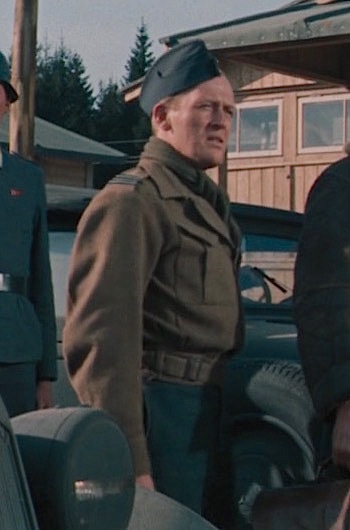 It also stars Donald Pleasance, this time as an SS officer. As the only major escapee from this list to be caught wearing a full German uniform, Haynes would have surely been executed for espionage rather than treated as an enemy combatant. 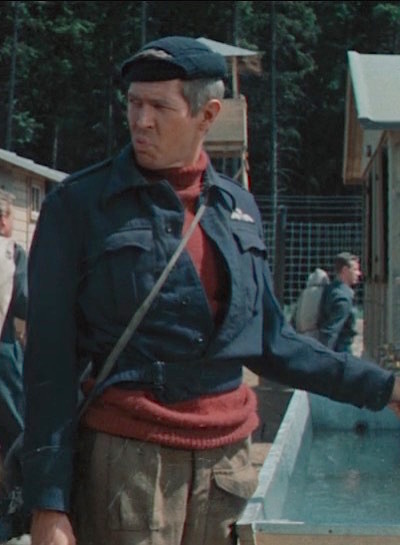 Though primarily a background character, Haynes serves up lewks in Stalag Luft III: first, casually rocking the blue-gray RAF “frock” sweater in a cabin, then dangerously sporting a camp-made Luftwaffe uniform for the actual escape. About a quarter to eight, Torrens had his bad moment. The door of 104 opened and he saw a German unteroffiizier walk in and stride down toward him, jackboots clumping heavily on the boards… He had a shattering, sick feeling that everything was lost, and then he saw it was Tobolski, the Pole. A controller had forgotten to warn him that Tobolski was going as a German, in one of Tommy Guest’s home-made uniforms. The uniform was a terrifyingly good imitation, with all the right swastikas and eagles and badges on it. If you compared it with a German uniform by daylight, you could see that the color was a shade bluer than German gray. Read more about Hendley’s dashing service uniform here. 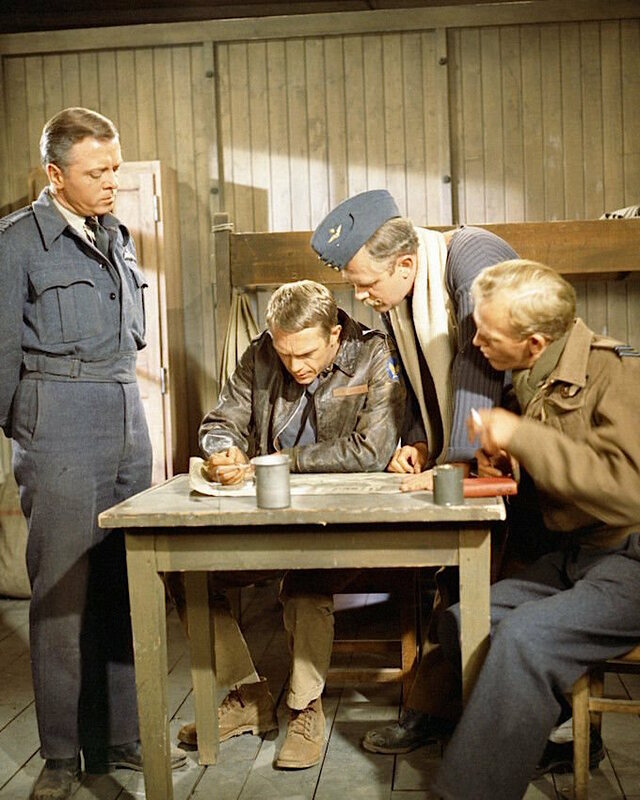 Based on: Several American officers, including Major John Dodge (“the Artful Dodger”), Major Davy “Tokyo” Jones, and RCAF Flight Lieutenant William Ash, among others. Read more about Hilts’ dressed-down wardrobe here. You can also find the actual shirt by Western Costume Co. that McQueen and his stuntman Bud Ekins wore on screen here. The most awarded—and highest ranked—officer in camp, Group Captain Ramsey’s campaign and award ribbons indicate service dating back to the early years of World War I, per his lower row of ribbons. However, he wears his campaign medals in the reverse order of wear; the colorful Victory Medal and the red, white, and blue 1914-15 Star should swap places. 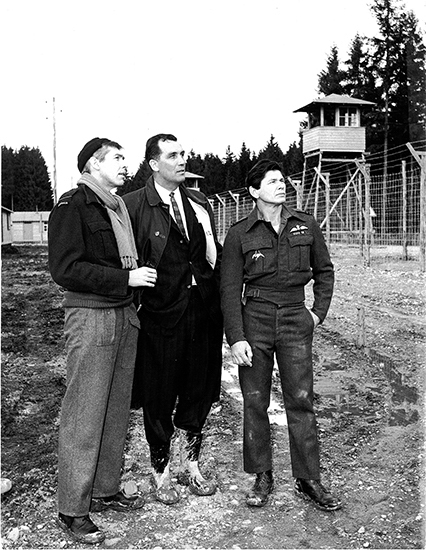 Sedgwick’s successful flight to freedom was clearly based on the actual escape of Bram van der Stok, a Stalag Luft III prisoner and the most celebrated aviator in Dutch history. 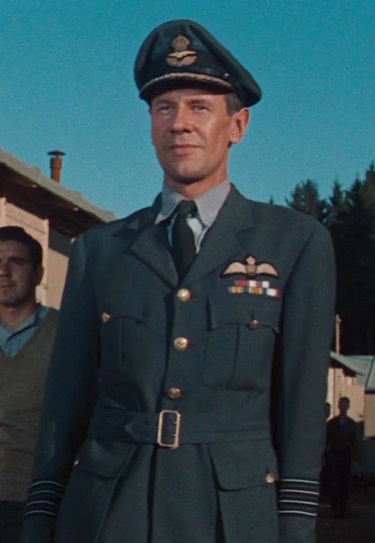 “Van Der Stok, Number 18 out of the tunnel, had traveled alone, wearing a dark-blue Australian Air Force greatcoat, Dutch naval trousers, and a beret,” describes Paul Brickhill in Chapter 21 of The Great Escape. 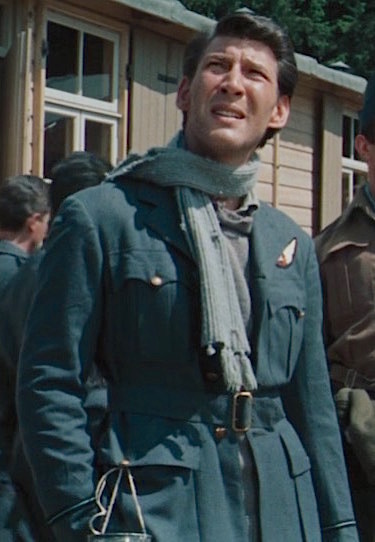 Sedgwick’s escape attire diverts from his real-life counterpart, but it’s significant that the Dutchman wore an Australian Air Force greatcoat for his escape and his cinematic counterpart’s nationality was changed to Australian. Cast members James Coburn and Charles Bronson are joined by Wally Floody on the set of The Great Escape, 1962. Floody was one of the real-life Stalag Luft III tunnel diggers. He survived the war and, almost 20 years after the escape, assisted the filmmakers as a technical advisor. 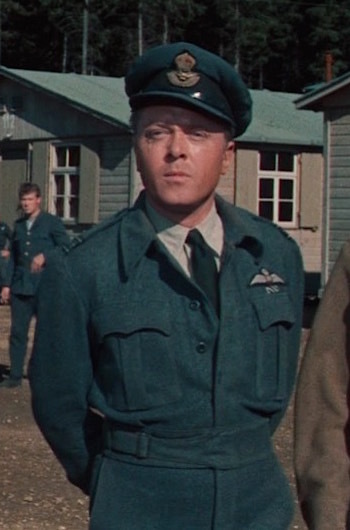 Paul Brickhill’s The Great Escape noted that, once all interred at Stalag Luft III heard the news of the fifty murdered airmen, they sewed black diamonds on their sleeve in remembrance. Check out the movie and original 1950 book by Paul Brickhill, one of the English officers who had assisted with the tunnels. The same with his clothes. [Marshall] was wearing one of Tommy Guest’s suits, and it was one of Guest’s best efforts, dyed dark gray, and it had been topped off by a ski cap till they took his cap away. “That’s a civilian suit,” the interpreter said. The interrogator pressed a button on his desk, and his stenographer walked through the door from an adjoining room. The brusque man behind the desk pointed to Marshall and spoke to her in German, telling her, apparently, to examine Marshall’s clothes. She stood in front of Marshall diffidently rubbing the cloth of his coat between bony fingers and looking at the seams inside. She was a gaunt, unhappy-looking woman, nudging the forty mark, with untidy gray hair and long features like a tired horse. Covered by her head from the interrogator, Marshall smiled into her eyes, and faintly surprised, she smiled back. Turning to the man behind the desk, she said they were not proper civilian clothes but—demonstrating with her fingers—had seams where one usually found them on uniforms. She left the room, and Marshall answered more questions, but his diarrhea of words exasperated the German so much that he slapped the desk with his hand and called the guard from outside, and Marshall was taken back to the jail. Group Captain Ramsey: Roger’s idea was to get back at the enemy the hardest way he could, mess up the works. From what we’ve heard here, I think he did exactly that. That first photo looks like a scene cut from the film, maybe Hilts demonstrating what lies between the compound and the town? Never seen that still before. Where did you find this? Outstanding. A great tribute to these brave men. Shortly after VE day, the British sent a special mission to investigate this war crime. It was headed by a brilliant detective (and ex_RAF officer) Frank McKenna. It resulted in 14 of the murderers being hung and a dozen or so more being jailed. I believe another 10 Gestapo men killed themselves while in custody. I once read that Hitler originally ordered that all the Great Escapers were to be shot, but was convinced to settle for 50. The Nazis were planning a great escape of their own servicemen from Allied camps later in 1944, and feared that the Allies would follow their example and shoot all the recaptured men.